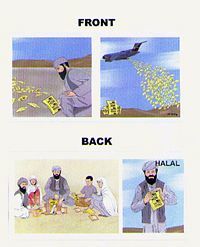 Humanitarian daily rations and contents. 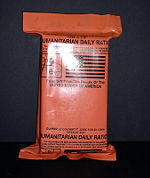 Humanitarian daily ration is the name for an emergency ration, with a long shelf-life, intended to be used for refugees during natural disasters, or in conflict areas. The meals are designed to be able to survive being air-dropped, without a parachute. This is safer for the refugees than parachuting large pallets of rations. And it prevents hoarding of the meals by a few individuals. The meals cost approximately 20 % the cost of a meal ready to eat. Prohibited contents Any animal products, except a limited amount of dairy products, below the limit that would cause a problem for a person with lactose intolerance. Salmon colored Humanitarian Daily Ration. The rations were first used in Bosnia in 1993. ↑ Judith McCallum. Humanitarian Daily Rations: Being Ready is Half the Battle, Defense Security Cooperation Agency, Winter 2001. Retrieved on 2007-10-18. ↑ Technical Data for Humanitarian Daily Ration. U.S. Department of Defense. Retrieved on 2007-10-18. ↑ Humanitarian Daily Rations. DCSA. Retrieved on 2007-10-18. ↑ 4.0 4.1 Operational Rations. United States Defense Logistics Agency. Retrieved on 2007-10-18. ↑ Albin R. Majewski. The Alphabet Soup of Combat Rations, United States Army, Winter 2001. Retrieved on 2007-10-18. ↑ Memorandum for Correspondents. United States Department of Defense (August 2, 1995). Retrieved on 2007-10-18. This page was last modified 05:53, 7 February 2010.